As things stand, the British economy faces a future of decline. But it doesn't have to be this way - there is an alternative. 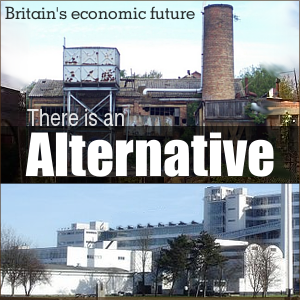 Here, we publish a full pamphlet from John Mills outlining his plan for the British economy after 2015. For a summary, see here. The next general election will be held in May 2015. No one can foretell the outcome. It is not so difficult, however, to forecast the more significant economic prospects and problems which will have to be faced by whichever party or combination of parties wins power. They are likely to be depressingly familiar and as apparently intransigent as ever. Even if the current not very convincing growth momentum is sustained, living standards as measured by average Gross Domestic Product (GDP) per head are still likely to be below those prevailing as far back as 2007. The foreign payments deficit is trending towards being considerably greater than the £60bn plus expected in 2013, further increasing the indebtedness of the country as a whole. A gap as large as this on foreign payments is another reason why the recent return to growth is, as Bank of England Governor Mark Carney acknowledged in February, both unbalanced and unsustainable. Even by the time of the 2015 general election the UK’s economic recovery, and with it the deficit-reduction plans of the three main parties, may be looking more doubtful. Total government debt will then be approaching 100 per cent of GDP. While this ratio has been much higher in the past, especially after major wars, on these other occasions there was a growing economy to absorb all the accumulated debt, which may be lacking in 2015. The widening balance of payments and growing national debt may by then be beginning to sap the optimism generated by rising house prices, dampening both consumer and business confidence, so that the modest growth which we are currently experiencing may well have lost pace. With current policies in place, the more government action there is in the run up to the election to stimulate the economy to produce a ‘feel good’ factor, the more daunting the foreign payment deficit – and with it the pressure to raise interest rates – is certain to be once the election is over. In addition, the incoming government in 2015 will have other familiar problems to face. The gap in incomes, wealth and every other measure of welfare both between the regions of the country and between socio-economic groups is alarmingly wide and shows little sign of narrowing. Manufacturing – and with it our main capacity for paying our way in the world – is likely to have shrunk further as a proportion of GDP to no more than 10 per cent – down from 32 per cent in 1970 and 24 per cent as late as 1980. Gross investment as a percentage of GDP – 13.5 per cent for the first three quarters of 2013, compared with a world average in 2012 of 23.8 per cent and 46.1 per cent in China4 – is unlikely to have improved much, if at all. Productivity per worker, up eight per cent in America since the crash, was down by five per cent in the UK at the end of 2013 and is unlikely to have picked up significantly by 2015. While the total number of people in employment, at close to 30 million, is at a record level, about eight million of those with jobs are only working part-time and there are almost five million other people of working age who are not working at all.7 At the same time, the number of people of retirement age is rising inexorably, precipitating the risk of widespread pensioner poverty as public expenditure becomes more and more stretched. We are therefore facing a very unpromising future. Unless the economy can be made to grow on a sustainable basis, we have in prospect years of stagnation while most of the adverse trends described above continue to move in the wrong directions. Is there anything that can be done to avoid these outcomes, or are they inevitable? The answer is that there is an alternative policy which could be fully implemented within a five- year term and which could transform our prospects. It would, however, involve radical changes from the orthodoxy that has prevailed in the UK for far too long. This policy is set out below. The first of the following sections describes some of the ways in which wrong policy choices in the past have led to our current condition. The second outlines in qualitative form what now needs to be done to get the economy to perform very much better. The third and really much the most important section shows in carefully quantified form how it would be possible over a five year period – possibly the five years following the next general election in 2015 – to transform our economic future into one where our rebalanced economy grows at four per cent to five per cent per annum, unemployment falls towards three per cent, investment rises together with living standards, inequality is diminished, the need for borrowing falls, inflation rises only slightly, and we can pay our way in the world. It sets out the calculations needed to demonstrate how all of these changes are possible. All we then need is the will and clarity of purpose to make it happen. We have placed excessive reliance on financial services. It is true that we have a comparative advantage in this sector of our economy and that its export performance is far better than in other areas, particularly manufacturing. In 2012 financial services alone generated a £36bn export surplus – about half the £74bn total surplus generated by the whole of the service sector.1 There are, however, major problems with the heavy reliance which the UK economy has on financial services. First, productivity increases are more difficult to achieve in this sector of our economy than in others. Between 1997 and 2012, despite the favour with which financial services were treated by the government over most of this period, output per head in this sector rose by 2.7 per cent per annum, compared to 4.8 per cent in information and communications and 3.3 per cent in manufacturing, although, to be fair, many other sectors of the economy did much worse.2 Second, financial services tend to produce jobs concentrated both in socio-economic and geographical terms which are heavily skewed to high-income occupations in the South East of the country, thus adding to both regional and occupational inequalities. Third, despite the impressive net export performance of financial services, support for the City has tended to have a correspondingly negative effect on industry, not least because of the City’s historic capacity to attract so much top talent which could have been put to better use elsewhere in the economy. Fourth, the City’s interests in the way the economy is run – particularly on monetary, interest rate and exchange rate policies and light regulation of what it does – often conflict with those of other sectors whose importance in aggregate is more significant than that of the financial services industry. We therefore need to reduce the salience of the City without compromising the contribution it ought to be able to make towards wider economic objectives. We have allowed our manufacturing base to be eroded away to an unsustainable extent. In 1970, 32 per cent of the UK’s GDP came from manufacturing. By 1997, the percentage was down to 14.5 per cent and by 2012 it had dropped to 10.7 per cent, compared with about 21 per cent in Germany and 19 per cent in Japan. There are three major adverse consequences which flow from this major change in the composition of UK output. One is that the decline in UK manufacturing has made a major contribution to the chronically rising deficit the UK has seen materialise on its foreign trade balance. This came to £107bn in 2012 – a much larger figure than the £74bn surplus on services. Goods make up about 60 per cent of our export earnings and we have no hope of closing our foreign payments deficit without achieving a better performance in manufacturing. Second, manufacturing provides a much better spread of high quality, skilled and well-paid blue collar jobs than is the case with the service sector. Third, manufacturing jobs, especially those generating high wages, were much more widely spread geographically when we had a much stronger manufacturing base than we have now with our current very heavily service-based pattern of employment. We have been remarkably casual in the way in which we have squandered opportunities, thus enabling us to live beyond our means. From the 1970s onwards, the UK enjoyed the uncovenanted and, up to then, entirely unexpected benefit of North Sea oil and gas which, at its peak in 1985, came to 4.6 per cent of world production, contributing 4.5 per cent to UK GDP while exports alone amounted to 2.7 per cent. This huge bonus might have been used, as it was in Norway, to build up a fund for the future when the oil and gas ran out, but this was not the UK way. Instead, nothing was done to stop the exchange rate rising to previously unheard of heights, on the monetarist principle that the high exchange rate was the inevitable mechanism whereby North Sea energy production would replace manufacturing. The fact that no such mechanism operated in Norway was conveniently ignored as UK manufacturing output plunged while imports flooded in, allowing UK consumers to benefit in the short term from exploiting the benefits from an irreplaceable resource, but with no long-term gain. In a rather similar way, the 2000s saw consumption in the UK running well ahead of what could be afforded, as huge quantities of UK assets were sold off to foreign interests, buttressing UK living standards in another unsustainable fashion. Between 2000 and 2010, net sales of portfolio assets – shares, bonds and property, but excluding direct investment in plant, machinery and buildings – came to a staggering £615bn, equivalent to roughly half of our annual GDP at the time, as we sold to foreign buyers our ports and airports, rail franchises and energy companies, industries such as Cadburys, swathes of expensive housing and much else besides. During the same years our cumulative foreign trade balance deficit – although far too high for comfort at £286bn – was less than half the net inflow of funds from portfolio asset sales. No wonder that the pound soared to £1.00 = $2.00, resulting in imports surging upwards as our manufacturing capacity went into a further steep decline. At the same time, as UK ownership of many key sectors of the economy passed into foreign hands, with it went their future profit streams as well as control over research and development budgets and investment planning. The UK at the moment displays all too clearly the signs of a society which has fought off relative decline by taking a more and more short-term view of the way ahead. We enjoy a current standard of living which is much too high to allow adequate room for the investment for the future that we need undertake. Too many of those running our major companies are more interested in share buy-backs to inflate their share prices and to increase their bonuses rather than in ploughing back profits to secure future growth and competitiveness. Banks are much more willing to lend money on mortgages than for supporting productive industry. Both as consumers and as beneficiaries of government expenditure, we tend as a nation to spend more than we earn, which is why we are running up more and more debt. We have lost sight of the need to live within our incomes. We simply have to replace this short-term approach with policies with a more distant horizon if we are to have a sustainable economic future. We have allowed an enormous divide to open up in the standard of living and life chances generally on every count between both the regions of the UK and between the richest and the poorest socio-economic groups. Recent figures – for 2011 − showed that average gross value-added per worker in Greater London was £35,638 compared with £15,842 in the North East, which is the poorest region in the UK. There may have been 619,000 millionaires in the UK in 2011, but even leaving aside the contribution to inequality made by the very rich, there are still enormous disparities. Office for National Statistics (ONS) figures for 2011 showed that the poorest 20 per cent of the population had average pre-tax household incomes of only £5,400 compared with the top 20 per cent with £78,300, although the disparities were considerably less – at £15,800 and £57,300 respectively – when all taxes and benefits were taken into account.14 Nor are these trends abating as government curbs on welfare payments begin to bite. At the other end of the scale, total pay for FTSE directors in 2013 rose 14 per cent to an average of £3.3m each15 while union-negotiated private sector pay rises to July 2013 averaged 2.5 per cent, down from 2.9 per cent a year earlier.16 Some degree of inequality in income, wealth and life chances is inevitable, but it is hard to grasp how much more unequal the UK has become since the mid-1970s when the Gini coefficient, which measures income inequality, was just over 23. It shot up to around 33 during the years of the Thatcher government, since when it has hovered at this level through successive governments.17 The figure at the beginning of the 2013 was 36. It had fallen slightly in 2011/12, mainly as a result of at least a temporary reduction in the more egregious financial service sector bonuses, but it is now expected to increase again as a result of government cuts in welfare expenditure. A substantial proportion of the recent increase in inequality in the UK derives from the huge rise there has been over recent decades in the number of people who are unemployed, partly masked by a succession of changes in the way the number of people without work have been counted. For the period July to September 2013, the headline unemployment rate was 7.6 per cent of the economically active population – a total of 2.47 million people. This, however, is a far cry from the long period from 1946 to 1973 when unemployment in the UK for the whole of these 27 years averaged no more than two per cent. Furthermore, as a report published by the TUC in September 2013 shows, the total number of people who would be capable of working if jobs were available for them at reasonable wages is not 2.47 million but estimated to be 4.78 million, including all those who have dropped out of the labour force because they are caught in benefit traps, have taken advantage of opportunities to get themselves classified as long-term sick or who have given up hope of getting a job and dropped out of the labour force. Furthermore, as many as 6.2 million of the 8 million working part-time, who are currently counted as being employed, regard themselves as being under-employed and would like to work full-time or at least for longer and more reliable hours. This level of lost employment is both a huge economic waste of resources and a massive tragedy for all those who would like to make a full contribution to society but are unable to do so. As the population ages and the economy stagnates, we are drifting into a major pensions crisis. Because people are living longer while the average retirement age is growing only slowly, the total number of people entitled to a pension is rising all the time in relation to those who are still working. Two-thirds of state benefits go to pensioners at present, a proportion which is continuing to rise. Over the period 2015 to 2025, the number of people who are over 65 in the UK population is expected to rise from 11.5 million to 13.5 million. Meanwhile, the retirement age is only planned to increase for men from 65 to 66 by 2020 and for men and women to 67 by 2026. Since a substantial proportion of pensioners are in contractual schemes, some of them, particularly in the public sector, including indexation clauses, there is going to be a major shortage of resources available to pay pensioners not covered by these sorts of schemes unless the economy can be made to grow much more rapidly. Since the crisis broke in 2007/08, there has been a massive increase in government debt brought about by huge gaps between government income and expenditure. The deficit peaked at almost £160bn in 2009. By 2012 it had fallen to an underlying figure, excluding special factors, of about £120bn, which is still about eight per cent of GDP. Clearly, having total government debt, now about 90 per cent of GDP, rising at this rate is unsustainable if the economy is not growing, especially if at some stage interest rates are going to rise from their current low levels. Government debt is to a significant extent mirrored by the country’s annual deficit on current account, which was £56bn in 2012 and on a rising trend. Partly as a result of the net sale of assets in the 2000s, the UK no longer has a net income from abroad to offset – at least in part – the trade deficit, while net transfers which the UK makes abroad every year are also increasing. Because to a large extent one mirrors the other, it is very difficult to see how, on present trends, it is going to be possible to reduce the government deficit to manageable proportions without our foreign payments balance being brought under control. There is, however, little sign of this happening. As part of the process of rebalancing the UK economy to make it capable of keeping up with the rest of the world over the coming decades, we have to stop relying on the ways of achieving growth that have been used over past decades. Household spending, at 62 per cent of GDP currently, has been relied upon too heavily, underpinned by asset inflation. This has both encouraged borrowing, which may become vulnerable to interest rate increases, and increased inequality, as those lucky enough to own houses that are rising in value leave further and further behind those with no such advantage. Reflecting the UK’s very low rate of investment, IMF figures show the UK consuming 87.8 per cent of our national output in 2012, compared to a world average of 75.9 per cent and 67.3 per cent for emerging and developing countries. The result is an economy which consumes too much, invests too little, and which cannot pay its way in the world. No wonder that we need so urgently to rebalance the UK economy towards investment, net exports and less dependence on borrowing from the rest of the world or selling assets to foreign interests. - Gross national product (GNP), which includes net income from abroad, must be a better measure of the total national income than gross domestic product (GDP) which excludes it. Our net income from abroad fell from £33.2bn in 2008 to −£2.1bn in 2012, equating to a drop of 2.4 per cent in GDP between 2008 and 2012, with a directly consequential fall in UK disposable income. - Over the same four-year period, government transfers abroad – the largest component being increases in net payments to the European Union as a result of a combination of the phasing down of the UK rebate and rising EU expenditure – rose from £13.8bn to £23.1bn. As all these extra net payments went abroad, none of them contributed to UK living standards. Their increase thus equates to another drop of 0.6 per cent of GDP in terms of incomes available to spend in the UK. - Between 2008 and 2012, the UK population rose from 61.8 million to 63.7 million. This rise in the population therefore reduced GDP per head – and the social capital of the country per head − by a further 3.1 per cent. - The fourth reason why households may have sensed a much greater squeeze than the official figures might suggest is because there is a substantial difference between the cumulative rise in the Consumer Price Index (CPI) between 2008 and 2012, at 13.4 per cent, and that of the deflator, at 8.0 per cent, which is the measure which ONS uses to move from nominal to real increases in GDP. Usually these measures of inflation run closely in parallel, and indeed for almost all the period from 2000 to 2007 the deflator was rather higher – 0.5 per cent per year on average – than the CPI. From 2008 onwards, however, the position was reversed and the CPI was an average of 1.25 per cent per annum greater than the deflator during the four years to the end of 2012. Apparently, this is mainly the result of ONS changing their methodology to take more account of estimated productivity changes in the non-market sectors of the economy such as the NHS, education, legal services and the armed forces. While there may be productivity improvements in the provision of these services, these are not caught in the CPI, which measures price increases only in the marketed sectors of the economy and which may therefore most commonly be used by most people to measure their current living standards. If, therefore, the CPI rather than the deflator is used to move from nominal to real GDP, this would reduce perceived standards of living by a further 5.4 per cent – the difference between the 13.4 per cent cumulative CPI increase and 8.0 per cent for the deflator. There have, however, been two important mitigating factors, although both of them involve serious long-term problems. One is that there has been a substantial shift in the proportion of GDP which goes to investment rather than consumption. This fell from 16.8 per cent in 2008 to 14.2 per cent in 2012. The second is that the foreign payments deficit has risen over the same period from 0.7 per cent of GDP to 3.5 per cent. Both these changes, adding up to 5.4 per cent of GDP, have buttressed current expenditure. Neither of them, however, bodes at all well for the future. Both of them are incompatible with any sort of longer-term growth strategy. The cumulative effect of the first three reasons set out above for believing that living standards have been much more heavily squeezed than is usually assumed to be the case comes to 6.1 per cent. If the CPI is believed to be the best way of moving from nominal to real GDP – which may well not be fair if the ONS have really got good reasons for their change of approach, but may be what a lot of people perceive – then the cumulative impact is a total of 11.5 per cent. Even allowing, in mitigation, for unsustainable reductions in investment and increases in the foreign payments deficit, the drop may still be over six per cent. No wonder squeezed incomes are now such a major political issue. These exceedingly depressing figures also tell a grave story, however, as to how much ground there is to make up and how desperately urgent it is that we adopt more effective economic policies than those currently in place. What, therefore, should the government, of whatever complexion it turns out to be, coming to power in 2015, do both to address the economic problems it will inherit and to avoid the mistakes made in the past which have led to our current weaknesses? Here is a ten point programme, initially setting out the problems which will need to be overcome in qualitative rather than quantitative terms. Once the scene has thus been set, the third section of this pamphlet then turns to quantifying what needs to be done. Overwhelmingly the most important objective must be to get the economy to start growing much faster. This is the only way in which living standards can be raised, unemployment reduced to tolerable levels, and reasonable levels of public expenditure can be combined with the willingness of the electorate to pay the necessary tax, fees and charges to fund them. A higher rate of economic growth is clearly what an overwhelming majority of the electorate would like to see materialising. There may well be arguments about whether faster growth will produce more happiness (at least among some sections of the population) and how rising GDP can be combined with the more ambitious parts of the green agenda. No doubt these points of view need to be accommodated and taken as seriously as they deserve to be. The fact remains, however, that the vast majority of the policies which most people want to see implemented are impossible to realise without faster economic growth. Furthermore, the rate of growth at which we need to aim has to be sufficiently high to enable the economy to meet the various claims that will be made upon it, not least because of population increases. Without population growth, a target increase in the growth rate to three or four per cent would probably be workable, but with the increasing number of people living in the UK taken into account, the target needs to be raised another percentage point to perhaps four to five per cent. To get the economy to grow at four to five per cent, there will have to be both a large and a sustainable increase in effective demand. This cannot be achieved at the moment by the traditional Keynesian approach of reducing taxation and increasing public expenditure, or by further increasing the money supply to stimulate consumer expenditure. We do not, in particular, currently have the manufacturing capacity required for a balanced and sustainable response to be possible. The UK economy would not therefore be able to react by producing the volume of goods and services needed. The outcome would in consequence be a soaring balance of payments deficit, which would very probably then be choked off by a deflationary rise in interest rates. For sustainability, the increase in effective demand has to come from elsewhere and this means from net trade – exports minus imports – and from much higher levels of investment. To achieve this, we have both to remove the balance of payments constraint which has hobbled the UK for the last 40 years and more, so that more demand does not lead to a balance of payments crisis. The only way in which it would be possible for this to happen would be for the UK to operate with a much lower exchange rate, relying on market forces to respond to the much greater profitability which would then be generated in manufacturing, exporting and import substitution than exists at the moment, to rebalance the economy to the necessary extent. How much lower an exchange rate would be required turns on how sensitive to lower prices the demand for our exports might be and the extent to which higher import prices would encourage home production instead of importing. These crucial ratios depend in turn on estimates of how big the change in profitability would need to be to shift the economy to achieving a manageable foreign trade balance combined with much faster growth. A vitally important part of this process has to be to revive the scale and competitiveness of UK manufacturing. A major reason why we have such a huge deficit in our foreign trade in manufactured goods is that we now produce so few goods in the UK that we simply do not have enough to sell abroad to pay our way in the world. All economies have special features, relating not least to whether they have indigenous raw materials or whether they need to import them, so that their ability to compete in world markets varies. Broadly speaking, however, for well diversified modern economies such as ours, international comparisons suggest that any with less than about 15 per cent of their GDP coming from manufacturing tend to have weak and constraining balance of payments problems. Once this percentage drops to barely ten per cent, as ours has, balance of payments problems are almost inevitable. A critically important objective must, therefore, be to get manufacturing as a percentage of GDP back to somewhere around 15 per cent. To do this at the same time as getting the economy as a whole to grow faster, with all the extra claims that this on its own is going to put on our manufacturing capacity, is going to require a major increase in its profitability which – again – only a much lower exchange rate will be capable of achieving, although the re-establishment of investment allowances and other similarly supportive fiscal changes would help. Changing price signals via a lower exchange rate, even if buttressed by a more favourable tax regime, although critically important, will fall a long way short of exhausting all the actions which the government will then be required to take to achieve a renaissance of UK manufacturing. There is also a wide range of supply- side policies which will need to be implemented to enable a much more rapid rate of growth to be achieved. A major increase in manufacturing is going to require a large amount of retraining. It will also require new production facilities, which will need the speedy granting of planning permission, and better infrastructure, particularly roads, rail facilities and high-speed internet connections. It will also be vitally important to ensure that there is adequate power-generation capacity available. Much better economic prospects will hopefully put much more of a premium on education − which is extremely difficult to achieve if large numbers of young people have no jobs awaiting them when they leave school and very poor employment prospects ahead. There will also clearly be a need for finance to be directed away from supporting equity withdrawal, based on house price increases and other forms of consumer borrowing, towards commercial investment in plant and machinery and working capital, although an increase in house building, especially in some parts of the country, and expenditure on public infrastructure, are also urgently needed. While it may well be sensible for the government not to be too prescriptive in determining how the economy should respond to much more favourable economic conditions, it is critically important that it has strategies in place which facilitate the market’s capacity to deliver the increase in output that will be needed. A key part of the adopted strategy should be to raise the number of people employed in the economy as much as possible, both to reduce unemployment and because increased labour inputs will greatly help to raise overall output. There is a major social component to this objective as well as this being a key part of getting government expenditure into better balance. Part of the social element is to remove from many people the stigma and bitter disappointment − and reduced living standards – which are the inevitable concomitants of being out of work. Another part is to increase the demand for labour in relation to its supply, thus shifting bargaining power back towards labour and away from employers. This need not be inflationary if the response from employers is to make better use of their labour forces by upgrading their skills and productivity instead of wasting talent in jobs requiring no training. Reducing unemployment thus has a major role to play in decreasing the inequality which disfigures the UK at the moment. Bringing millions of extra people into the labour force will also, of course, make switching the economy into a relatively high rate of growth much easier to achieve than if there was already full employment. Indeed, paradoxically, it is the fact that there are such huge unused labour resources in the UK at the moment that makes it possible to produce the surge of extra output needed to enable us to invest in a much better future and to get the economy to grow much faster on a sustainable basis. Because unemployment is heavily concentrated in those areas of the country which used to be disproportionately dependent on manufacturing, it would obviously make sense to encourage new manufacturing opportunities to be sited as much as possible in these areas. These parts of the country are likely to be favoured in any event by those needing to take on additional labour and who want to keep their costs down as much as they can by avoiding the relatively high cost-base in the South East of the UK. A revival of manufacturing along these lines, with all the secondary impact that this would have on supporting service industry activity in the areas where manufacturing was re-established, would clearly help to rebalance economic activity across the regions of the country. This kind of activity would also help to achieve the necessary rebalancing of the economy away from the excessive dominance of financial services. The objective would not be to damage the role which the City plays in the economy but to make sure that the services it provides are used to complement activity in the rest of the economy, rather than to undermine it by pressurising the government to implement policies which benefit those in financial services at the expense of everyone else. Included in this category of change would be monetary and other policies to benefit lenders rather than borrowers, particularly those which make credit more expensive and difficult to obtain for productive investment than it needs to be. If government debt is growing rapidly but the economy is expanding much more slowly than is total government borrowing, with no relief in sight, then clearly there is a major problem, potentially leading to eventual insolvency. Similar considerations apply to the foreign payments balance. If, however, the economy is growing rapidly, these problems become much less acute. Provided that these debts are growing more slowly than the economy, the situation will be manageable for as far ahead as can be seen. The fact that this is the case makes the expansionary policy envisaged in this pamphlet much more feasible and achievable than it otherwise would be. For example, if the economy were growing consistently at five per cent per annum, both a government deficit and a foreign payments deficit of, say, four per cent of GDP would be sustainable. To proceed with a margin of safety, it may not be prudent to push matters to the limit like this. It would, however, be possible to continue with both government and foreign payment deficits of perhaps two or three per cent, or to have higher percentages on what was clearly going to be only a temporary basis. This provides a very substantial element of flexibility. The objective, therefore, should not necessarily be to reduce or to eliminate either of these deficits but only to ensure that as a percentage of GDP they both become lower than the growth rate. A policy along these lines, with no export surplus being generated by the UK to cause correspondingly increased deficits elsewhere, would also have the advantage of making whatever devaluation was required to get the required policy changes in place much easier to achieve and to sell to the rest of the world. Keeping these deficits in place would also make it easier to get and to keep the pound at a competitive level. A crucial requirement for getting the UK economy to grow much more rapidly on a sustainable basis would be to get gross investment as a percentage of GDP up to a much higher level than it is at present. Even as recently as 2008 it was 16.7 per cent, although this is still far below the world average. By 2012, according to world rankings produced by the CIA, with slightly different figures from those provided by the ONS, it had fallen in ratio terms by a further 8.5 per cent to 14.2 per cent, which is one of the lowest in the entire world, ranking the UK’s proportion of GDP devoted to investment as low as number 142 – equal with El Salvador – out of 154 countries in a recent survey with data from 2012.1 ONS figures for 2013 show the trend getting worse and not better – down to 13.5 per cent in 2013.2 Furthermore, while the position on gross investment is bad enough, net of depreciation it is even more disastrous. Of the £224bn3 gross investment in the UK in 2012, £176bn4– almost 80 per cent of the total − was offset by capital consumption, or depreciation to allow for expenditure on keeping existing assets from deteriorating. This left only £48bn – three per cent of GDP − as net new investment. In China the ratio is about ten times as much.5 No wonder that their economy keeps growing at nearly 10 per cent per annum while ours stagnates. The problem with getting the investment ratio up, however, is that there is no way that this can be done other than by reducing, at least in terms of percentages of GDP, other calls on the economy’s output. It is clearly not possible to use the same resources at the same time for both increasing investment and providing for consumers’ or government expenditure. How much investment would have to grow as a percentage of GDP to sustain a growth rate of, say, five per cent depends very largely on how productive the investment is. This is measured by the social rate of return on investment, also known as the incremental output to capital ratio, which includes all the additional value created as a result of investment not only in returns to whoever put up the money, but also in the form of increased wages and profits to those benefiting from increased output, higher tax receipts and better quality goods or services. These overall rates of return can and do vary enormously. For infrastructure projects they are typically relatively low, but for much of light industry, for example, they can be very much higher. Investments with a short gestation period are also very much better at producing cumulatively better returns than those with long pay- off periods. A crucially important policy requirement is therefore to bias, as far as possible, gross investment into projects which have both a high social rate of return and short gestation periods, while at the same time keeping a reasonable balance between public and private investment, both of which will be needed for balanced growth. If policy changes along the lines proposed so far are to be acceptable, it is also very important that they do not generate unmanageable inflationary pressures. It is, in fact, very difficult to combine as fast a rate of growth as five per cent with inflation as low as two per cent, mainly because productivity increases tend to be more unevenly spread in economies which are growing fast than those which are not, causing an averaging process – leading sector inflation – to materialise. This might well lead to the Consumer Price Index (CPI) rising at more than two per cent per annum, but probably with a growth rate of four to five per cent per annum, not much more – maybe three to four per cent if the right policies are pursued. Disinflationary policies associated with getting sterling to a much more competitive level would need to include lower market interest rates, based on a more competitive banking environment, and lower taxes, such as a reduced rate of VAT and lower National Insurance contributions, to complement the benefit of increasing productivity in ensuring that wage increases do not get passed through to the CPI in full. Especially if there were a tighter labour market, the co-operation of our trade unions would be vitally important in ensuring that the medium and long-term prospects of their members enjoying much higher living standards were not compromised by derailing the policies needed for better medium-term economic performance by excessive wage claims in the short term. International evidence strongly suggests that it is much easier to create a co-operative wages climate with fairly full employment against a background of successful growth policies than ones involving years of cut-backs and failure. Finally, for the policies proposed to be acceptable, they will need to ensure that they provide enough resources to the government to avoid damaging cuts in public expenditure, especially those that hurt the most disadvantaged or which undermine society’s cohesion. Of course, at all times we need to try to make sure that public spending is well targeted and avoids waste, but it is hard to believe that slashing arts budgets or curbing entitlements to the poorest – now increasingly dependent on food banks to keep body and soul together − improve the way we run our affairs. Faster growth and lower unemployment, however, would both increase government revenues and reduce some of the reasons for expenditure. At the moment, taxation, government fees and charges amount to about 38 per cent of GDP whereas government expenditure comes close to 44 per cent.6 It may well be that the best approach to closing this six per cent gap – or at least substantially reducing it – would be to bring expenditure down to about 40 per cent of GDP – the level it was as recently as 2004/05.7 With GDP rising strongly and calls on government spending to deal with the consequences of high unemployment and dependency having been substantially reduced, it would be possible to avoid cuts in expenditure while reducing the deficit and still making room within GDP for much higher levels of investment. On a similar footing, it would be possible to increase post-tax living standards for almost everyone during the period when the UK economy transitions to a much higher and sustainable growth rate. This has to be a key component in producing a mix of policies which it would be feasible to persuade the electorate is worth pursuing. It is one thing to set out in broad qualitative terms what needs to be done to get the UK economy growing much more rapidly, and thus to provide the basis for tackling many of our other problems. It is another to show that the policies set out above are capable of fitting together quantitatively into a programme capable of being executed successfully within the term of one parliament. This is the next objective. The plan for achieving this goal is encapsulated in the figures of Table 1 on pages 14-15. The starting point for the table consists of figures taken from the latest available Office for National Statistics (ONS) Quarterly National Accounts, which cover the period to the end of the third quarter of 2013. The spreadsheet covers the period from 2013 to 2018 rather than 2015 to 2020 so that it is based on the most recently available ONS figures, but it can easily be rolled forward as new starting data becomes available. The figures in the table are all colour coded. Those in black are ONS figures. Those in red are estimates for what might reasonably be expected to be the appropriate figures in the future. Those in green are calculated from those already there in black and red. Underneath each of the headings are the four letter codes used by ONS to identify each of the headings in their statistical tables. The top band of figures shows the projected position over the next few years in money terms and the band below shows the same figures in real terms, using the projected annual changes in the CPI to move from nominal to real figures. This seems a safer assumption to make than the approach taken recently by the ONS, which has assumed substantial increase in GDP not caught by measurements of price increases in the marketed sectors of the economy, which the CPI measures. 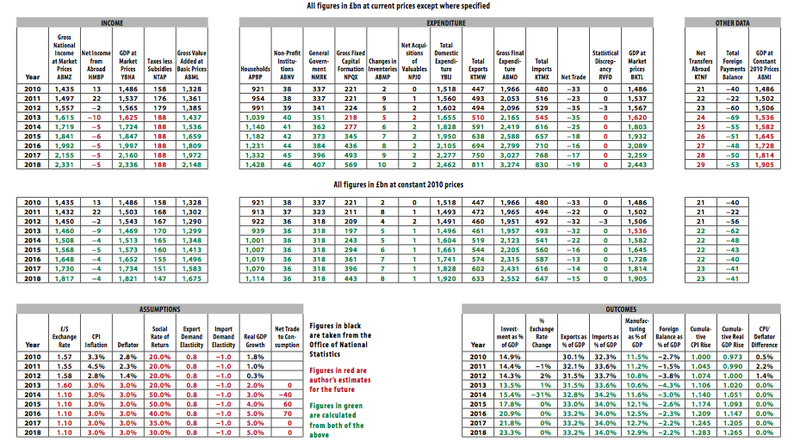 At the bottom of the spreadsheet are set out the assumptions on which the figures in the table above are based. The sensitivity of demand for exports and imports – the elasticity of demand for each of them – is shown in the spreadsheet as 0.8 for exports and −1.0 for imports. These figures, to be achieved by the end of a two to three year transitional period, allowing for time lags which need to be taken into account as explained below, are considerably lower than those in a recent (2010) report produced by the International Monetary Fund (IMF) which projected the elasticity of demand for UK exports to be 1.37 and for imports −1.68.1 They are, however, more in line with a considerably less recent report (published in 1987) with elasticities for the UK respectively of 0.86 and −0.65.2 These lower elasticities seem to have reflected more accurately our experience when the rate for sterling against the dollar dropped from about $2.00 to $1.50 between 2007 and 2009,3 although between 2009 and 2012 exports of goods did rise 31 per cent by value and 17 per cent by volume.4 Unfortunately, however, imports rose by about the same amount, starting from a higher base, so the balance of payments did not improve. The explanation for this may be that at $1.50 to $1.60 the exchange rate was still far too high to offset the chronic decline in UK manufacturing as a percentage of GDP and for import substitution on a major scale to be feasible. It may be significant that the 2010 report – which covered the early 2000s – showed the elasticity for imports to be numerically much higher than for exports, showing how important import substitution may be. The condition to be fulfilled for a devaluation to improve any country’s trade position – the Marshall-Lerner Condition5 – is that the numerical values of the elasticities of demand for exports and imports (ignoring the negative sign for imports) has to be more than unity. This condition is clearly comfortably met by both the 1987 and 2010 reports, but particularly the latter. The exchange rate is projected to fall from its current level of about £1.00 = $1.60 to £1.00 = $1.10, with the same reduction applying against all currencies, as from the beginning of 2014. Calculations exemplified in the spreadsheet show that a devaluation of this magnitude is very probably going to be required to rebalance the UK economy to a sufficient extent towards manufacturing, investment and exports to provide both the overall growth rate and the improvement in the payments balance required to produce a sustainable future growth path − especially if the export and import elasticities are not as high as they may be. As explained in more detail below, it is also likely to be necessary to have a devaluation of this size to enable household expenditure to increase and for there to be consequential improvements in living standards throughout the transitional period – a vital requirement to make the change in economic strategy proposed generally acceptable to the electorate. Reducing the external value of the pound from $1.60 to $1.10 implies a 31 per cent devaluation, which is about the same as the 28 per cent fall in 1931 against the US dollar, when the UK came off the Gold Exchange Standard.6 In 1992, when we left the Exchange Rate Mechanism (ERM), the devaluation was about 20 per cent.7 Our own historical experience and the recent fall in the Japanese yen – from 77.6 to 103.4 yen per US dollar within the 12 months to June 2013,8 a reduction of 33 per cent − show only too clearly that getting the exchange rate down can be done by a government determined to achieve this objective. Consumer Price Index (CPI) inflation is projected to rise a little from its current level and to stabilise at three per cent per annum. It is widely believed that devaluations always produce increased inflation, but this is based on a priori assumptions rather than on looking at the experience of advanced and diversified economies such as ours when devaluations occur. Sometimes inflation increases slightly but often it does not do so – as was the UK’s experience, for example, both after the 1931 and 1992 devaluations.9 Of course import prices have to rise – as does the cost of foreign holidays – if the currency has a lower external value, but strong disinflationary factors also kick in. With a lower exchange rate, both market interest rates and taxation can be lower. Production runs increase, producing economies of scale and lower costs. Sourcing tends to become more locally based, moving away from now more expensive foreign suppliers. Productivity increases in manufacturing tend to rise sharply as increased investment comes on stream, again reducing costs. All these factors help to generate a wages climate where moderation prevails, making it more rational for sectional interests not to press their claims too hard. Nevertheless, historical experience shows that inflation does tend to be rather higher in fast-growing economies – largely because of an averaging effect between sectors of the economy where productivity increases fast and where this is not possible – so making provision for some increases in the CPI above two per cent would be prudent. The social rate of return on investment – i.e. the return not only to whoever pays for the investment but including all the benefits which flow from it in the form of higher wages and profitability, increased tax receipts and better quality goods and services – is projected to rise strongly as more investment takes place and unemployment falls steeply. The assumption made in the spreadsheet is that the increase in investment, over and above what would probably have taken place on current trends, would have a social rate of return of 50 per cent for a couple of years, falling to 30 per cent. Figures as high as this would only be possible if a substantial proportion of new investment were in manufacturing and if there were ample new labour to draw into the labour force, but it is strongly reflected in the experience of economies pulling out of conditions where there are large pools of labour available to be drawn into production. Perhaps the most telling was the experience in the USA at the end of the 1930s and early 1940s as its economy was propelled by the need for war production out of the very depressed conditions it had experienced during most of the 1930s. Between 1939 and 1944, US GDP grew by 75 per cent, a compound annual rate of almost 12 per cent. Over the same period, industrial output increased by over 150 per cent, while the number of people employed in manufacturing rose from 10.3m to 17.3m, an increase of just under 70 per cent. Productivity rose by some seven per cent per annum.10 Similar if not quite such spectacular results were achieved in the UK after the 1931 devaluation. Between 1932 and 1937, the UK economy grew cumulatively by just over 3.8 per cent per annum as manufacturing output rose by 48 per cent and the number of those in work rose from 18.7m to 21.4m as 2.7m new jobs were created, half of them in manufacturing. Evidence that returns to investment can be as high as this, at least on a temporary basis, is buttressed by the result of studies showing that right across the world in the 1960s the average incremental-output-to-capital ratio was as high as 25 per cent, peaking at 30 per cent in 1964, although it has fallen since, no doubt as a result of the much less favourable growth policies pursued since then by nearly all industrialised countries. At the top part of the table, Net Income from Abroad is projected to stay slightly negative while Net Transfers Abroad are expected to rise slowly, mainly as a result of our increasing net transfers to the European Union, which are projected by the Office for Budget Responsibility to rise by a total cumulatively of about £10bn over the period between 2013 and 2018. Net Income from Abroad fell from an average of £21.6bn per annum between 2007 and 2011 to −£2.1bn in 2012. The main reason for this is a very steep fall in Portfolio Income, largely as a result of the major sell off of UK assets which took place in the 2000s, combined with a recent fall in Di- rect Income from Abroad, which appears to be the result of major debt write-offs by UK-owned banks domiciled for tax reasons in countries such as Holland and Luxembourg. Neither of these trends is projected to be reversed in the near future. To avoid circularity in the spreadsheet, it is then necessary to make assumptions about what the resulting increases year by year in Gross Domestic Product would be and these are set out in the spreadsheet. The increases in GDP have, however, to be consistent with the other figures in the spreadsheet and considerable care has been taken to make sure that they fulfil this requirement. - The impact on export performance from an elasticity of demand for exports of 1.0 is that, measured in the domestic currency, each one per cent devaluation increases the volume of exports by one per cent. The projected figures for exports from 2014 onwards are thus calculated (subject to the points in 4b below) by starting with the previous year’s figure and then taking account of the impact of any change in the exchange rate, growth in the economy and the rise in CPI in the top band of figures which allow for inflation but not those further down which do not. - The IMF figures for the sensitivity of export volumes to changes in their price level, reflecting widespread experience referred to as the J-curve effect, show that it takes two or three years for their impact to be fully felt on the trade balance. For the first year or so, while the economy adjusts to the new price signals, the impact is much less. To allow for the fact that it will take up to three years for the economy to adapt to its more competitive status, the rise in exports as set out in paragraph 4a above is assumed to take place over a three-year period with one third of the impact being felt each year. - The impact on imports of an elasticity of demand of −1.0 – again measured in the domestic currency – is that, for each one per cent reduction in the exchange rate, import volumes will fall by one per cent but rise by one per cent in value. This means that with an elasticity of, say, −1.0, the reduction in volume and the increase in value cancel each other out, leaving imports by total value the same as they were before. If the elasticity is not −1.0 but some other figure such as −1.2 then the effect of a one per cent devaluation would be to reduce import volumes by 1.2 per cent while their value rises by one per cent, the overall effect being that in this case imports would fall in total value by 0.2 per cent. - However, a devaluation of, say, 30 per cent will not change import and export prices by this full percentage. Exporters will use some of the reduction in their costs to improve their margins and importers will react the opposite way. It is assumed in the spreadsheet, in the light of experience from previous major exchange rate changes, that one third of the reduction in the exchange rate will be effectively eroded away in this respect. - Historical evidence, also exemplified in the IMF elasticity figures, also suggests strongly that it takes longer for export than import volumes to increase. In the spreadsheet it is therefore assumed that import volumes rise by 10 per cent more than they otherwise would have done in 2014, the year when the devaluation is shown in the spreadsheet as taking place, before increasing by five per cent less for the next two years as the impact of the devaluation on import substitution works its way through. This is likely to be the outcome not least because higher volumes of manufacturing are bound to lead initially to steep increases in the purchase of both capital equipment and raw materials from abroad. - With these assumptions, a devaluation from $1.60 to $1.10 (with equivalent reductions in the value of sterling vis à vis other currencies) would remove the foreign payments deficit in three years if no other action were taken. There would be a short-term increase in the deficit, which would no doubt help to get the external value of sterling down, before the current account stabilised with a relatively small surplus, taking account of the fact that the trade surplus has to be large enough to cover deficits on Net Income and Transfers. For the reasons set out below, however, there may be strong arguments for taking action to avoid the foreign payments gap closing as fast as this during the transitional period to faster growth. - On the basis of all the assumptions set out above, it would be possible to expand the economy by up to three per cent per annum in real terms, rising to five per cent. As productivity increases may remain, at least initially, at no higher than their historical average of about two per cent per annum – and in the light of recent experience they may be less − there would be a cumulative increase in the demand for labour, which would increase the labour force by at least two per cent multiplied by about 30 million – the approximate size of the current UK labour force − or 600,000 per year. Past experience indicates that it is likely that about two-thirds of the newly employed would be those previously registered as unemployed and one third would be people drawn into the labour force who had not previously been looking for work. No allowance has been made for increased inward migration, if the UK economy started to perform much better than others in the EU which, however, could well increase the amount of available labour by a further substantial number of potential employees, albeit while putting a further strain on the UK’s infrastructure, housing stock and capital assets generally. - To cater for both increased manufacturing and net trade output requirements as well as increases in demand from consumers, the voluntary sector and government, gross investment as a proportion of GDP would need to rise from about 14 per cent, where it is at the moment, to well over 20 per cent. It would be possible for this to happen while still allowing household expenditure to increase by an average of rather more than three per cent per annum, by using increased GDP to provide most of the resources needed to accommodate all these claims on UK economic output at once. As explained in more detail in paragraphs 5g and 5h below, however, all these outcomes could only be achieved together if the UK continued to run a substantial balance of payments deficit for some years – a strategy which it would nevertheless be safe for us to adopt if our economy were growing fast enough. - About 75 per cent of all our visible exports and imports are manufactured goods. If this proportion of the increase in exports and reduction in imports in real terms is achieved by both increasing export volumes and import substitution, the proportion of GDP coming from manufacturing in the spreadsheet would rise from 10.7 per cent in 2012 to about 13 per cent in 2018. This percentage does not, however, allow for the need for a further improvement in net trade required to close the foreign payments gap, so the proportion of GDP derived from manufacturing would need to rise further, to about 15 per cent if the foreign deficit is to be eliminated. Table 2 on page 24 estimates how the proportion of GDP devoted to manufacturing would rise between 2013 and 2018 from 10.6 per cent to 12.9 per cent. This would be an increase between 2010 and 2018 of just under 45 per cent in absolute terms, involving manufacturing output expanding at an average of 7.5 per cent per annum, at the same time as the economy. expands between 2013 and 2018 by 24 per cent in real terms – from £1,536bn to £1,905bn at 2010 prices, an average of 4.4 per cent per annum. An increase in output of 7.5 per cent per annum in manufacturing from the current low base should be achievable but, if not, the consequent strain on resources could be taken by running a somewhat larger balance of payments deficit for a bit longer. This rate of growth in manufacturing output depends heavily on the social rate of return (the same as the incremental output to capital ratio) being high enough to enable all the figures to hang together. This is only likely to happen if the UK economy combines rapidly reducing unemployment with a recapturing of a sufficiently substantial amount of the highly productive light industry, with high returns and short gestation periods, that has migrated to the Pacific Rim. This, in turn, will only occur if the cost-base in the UK is charged out at a rate which is sufficiently competitive to make this possible, which in turn makes the deep devaluation posited an essential component of the strategy. If these very high returns on investment cannot be achieved, at least for a short period while many currently unused resources, particularly labour, are pressed into service, the prospects of achieving sustainable high growth become much harder to realise. The lower the social rate of return, the more investment is required for any given rate of growth, the fewer resources are available to reduce or close the foreign payments gap and the greater the negative impact on current living standards. It should be possible to achieve significant decreases in inequality on two counts in the circumstances portrayed in the spreadsheet. A big increase in manufacturing output would disproportionately benefit the regions of the country outside the South East and a tighter labour market should tend to increase the bargaining power of labour, thus bidding up wage levels among those on relatively low pay at the same time as much more high-productivity employment would become available. By altering the assumptions towards those reflecting the current parameters, the spreadsheet also shows how dismally poor the prospects are going to be for any government elected in the near future in the UK without a radical change in economic policy. Without an expansionist devaluation strategy, growth in the economy is unlikely even to keep up with population growth, leading to stagnant living standards as far ahead as can be envisaged. Even with a heavy devaluation, however, the position remains challenging because of the need to shift so significant a proportion of GDP into investment and net exports without squeezing consumption and living standards. Even with much faster growth and with constraints on public and voluntary sector expenditure, it would take three or four years before increases in consumer expenditure would be possible unless countervailing action is taken to deal with this factor. There is, however, a solution to this problem. Deficits on both foreign payments and government expenditure are only unmanageable if the rate at which they are rising is greater than the rate at which the economy’s capacity to service them is increasing. If the economy is shifted to rapid growth, deficits of their current size become far less important and dangerous. The solution, then, to ensuring that household and government expenditure avoid getting squeezed unnecessarily hard – and indeed are allowed to grow every year – is to allow borrowing from abroad (i.e. running a payments deficit) to take the strain during the transition period. This would need to be done by government action to increase demand so as to channel the main effects of a much lower exchange rate during the transitional period not only towards rebalancing the economy towards exports, investment and import substitution but also to increasing household and government expenditure. The result would be a continuing balance of payments deficit. This is reflected in the spreadsheet in the assumptions at the bottom of the table under the column heading ‘Net Trade to Consumption’. This points to the action which the government would have to take through fiscal and other policies temporarily to keep consumption rising − at the same time as increasing investment − by borrowing from abroad. The main way in which this would need to be done would be to allow for large increases in imports of plant, machinery and raw materials to be reflected in a continuing balance of payments deficit. - The growth rate could be stepped up to as much as five per cent per annum on a sustainable basis. - The foreign payments deficit would hover at no more than around four per cent of GDP throughout the five-year transitional period, but at the end of this period it could clearly be made to fall. - The percentage of GDP devoted to gross investment would rise from its current level of less than 15 per cent to about 23 per cent − about the world average. This is essential if the economy is to embark on a sustained growth path. - Manufacturing output as a proportion of GDP would rise from 10.6 per cent in 2012 to about 13.0 per cent in 2018, which is getting close to the level necessary for the UK to have a foreign payments balance which is no longer a constraint on the expansion of domestic demand and on the attainment of reasonably full employment. For this to be achieved, manufacturing as a percentage of GDP would probably need eventually to be about 15 per cent. - Consumer expenditure could increase in real terms every year. The projected rise is 19 per cent over the five year period from 2013 to 2018 – 3.5 per cent per annum − but this does not allow for any increase in the population. If the number of people living in the UK continues to rise at around 0.6 per cent per annum, as it has done on average for the last four years, then the increase in GDP per head per year would be closer to three per cent. If, as a result of much better economic prospects, the personal savings ratio were to rise from its present very low level – 5.4 per cent, which is one of the lowest among developed countries − this would make it possible for incomes to rise somewhat faster than household expenditure. - Registered unemployment would fall by about 400,000 a year or more for two or three years, reducing its level towards three per cent, although the total employed labour force would rise by about 50 per cent more than this, i.e. by an aggregate of 600,000 per year. Increasing the size of the labour force would be a crucial element, buttressed by much higher levels of investment, of the strategy to get the economy to transition to a much higher growth rate. - It would very probably be difficult to keep inflation as low as two per cent, but with appropriate government policies on taxation and interest rates in place, it should be possible to keep average inflation over the period at around three per cent, or perhaps four per cent at worst. It is widely believed in the UK that there is relatively little that can be done to get the economy to perform significantly better than its present level. This pamphlet shows that perceptions of this sort are wholly inaccurate. While there is certainly room for disagreement as to whether all the assumptions made above are accurate as they stand or whether they may require some modification, the overall strategy which they underpin would allow for very considerable variations in the assumptions to be made while vastly improved economic performance would still be achieved. Furthermore, while the projections in this pamphlet are all based on there being no major developments outside the UK which have a heavy impact on the way our economy performs during the next few years, obviously, if some do occur – which seems very probable – appropriate adjustments in policy to take account of them would need to be made. Whatever happens in this respect, however, the UK economy would be in a much better position to respond to whatever events do materialise than it would be if present policies continue. The problem with managing the UK economy is that, for far too long, there has been an assumption that the only two major macroeconomic ways of controlling the economy available to the government are fiscal policy on the one hand and monetary policy on the other. The third, perhaps even more powerful, way of influencing economic outcomes – exchange rate policy – has been almost entirely ignored. This is one critical mistake which our policy makers have made. The other is to believe that having low levels of inflation, entailing a target of no more than two per cent increases in the CPI per year, as the primary economic goal will somehow produce a growing economy whatever happens to our international competitiveness. There is no evidence that this is realistic. Without rectifying these critical misconceptions, there is no mixture of policies which is going to get the British economy back on track. With all three policies for controlling the economy working together, however, and without taking undue risks with inflation, it is comparatively easy to see how our economic prospects could be transformed. This is what we need to do. A major change in the perception of economic policies and strategy is going to be needed but it is all possible, achievable and viable. There is an alternative and we need to start implementing it as soon as we can. This pamphlet was first published by Civitas, and a fully referenced version can be found on their website.